Lego Worlds Isn’t a Minecraft Killer, but it Sure is Fun! Since it’s creation, the most common way to describe Minecraft has been as “virtual lego”. Now, there’s a game which is literally virtual lego. “Lego Worlds”, a lego game made by Warner Bros, is the latest in a long line of potential “Minecraft killers”. Since it’s beta opened yesterday on Steam Early Access, I decided to take a look at Lego Worlds, and see what all the fuss was about. At this point, it’s important to note that Lego Worlds is in Early Access, and is effectively a Beta product. Similar to Minecraft’s early development, a lot of what we see now might change before the game is fully released. Despite that, the game is quite impressive already, and of a much higher quality than the normal early access fare. Comparisons between Lego Worlds and Minecraft are unavoidable, as both games are 3D procedurally generated worlds that let players explore, have no real story or structure, and are both fairly blocky. However, where Minecraft is completely cubic, Lego Worlds provides the full palette of Lego bricks, including slopes and circles. Furthermore, Lego World relies a lot more on exploration. When you start out, you have a few models you can place down on the ground, but you need to explore the world to find more. Fortunately, this can be done simply by touching or punching new objects. For example, I drove through a farm, and was able to get a windmill model by driving near it. A similar system applies with animals and vehicles – once you’ve driven/ridden in/on one, it’s part of your collection. That’s how I managed to acquire a red dragon, steamroller, motorbike and a few other vehicles. Speaking of dragons, they’re awesome to fly around on, with the bonus feature of being able to shoot fireballs. 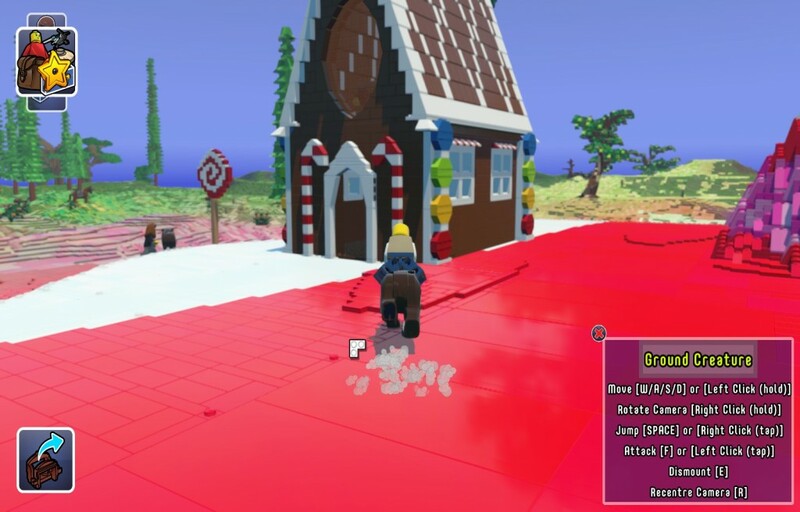 Furthermore the world generation includes a number of lego sets, such as the gingerbread house shown above, farms, villages, cities and volcanoes. I’m sure there is a lot of stuff I haven’t found so far, but what I have found is pretty cool. 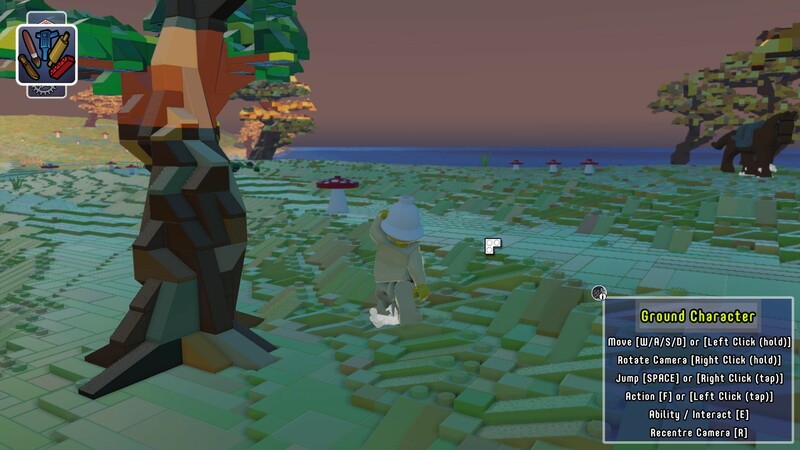 In terms of graphics, Lego Worlds is a much prettier game than Vanilla Minecraft. I played with all settings on high, and as the screenshots show, it looks beautiful. Furthermore, Lego Worlds doesn’t abruptly cut off past the view distance, which is nice. The extreme depth of field is unnecessary, and makes flying around annoying, as you can’t clearly see what you’re shooting fireballs at. Another problem is the third person camera. While it’s generally acceptable, there were a number of occasions where it tried to automatically recentre itself, leading to confusion. As an early access game however, I’m hoping that this is ironed out before final release. Along with all this exploring, you can also build structures with lego bricks, although I personally found this time consuming and tedious, and preferred the exploration. I hope that this feature is improved throughout the course of early access, because I think it could benefit from something like WorldEdit, to give you more granular control over what you’re building. 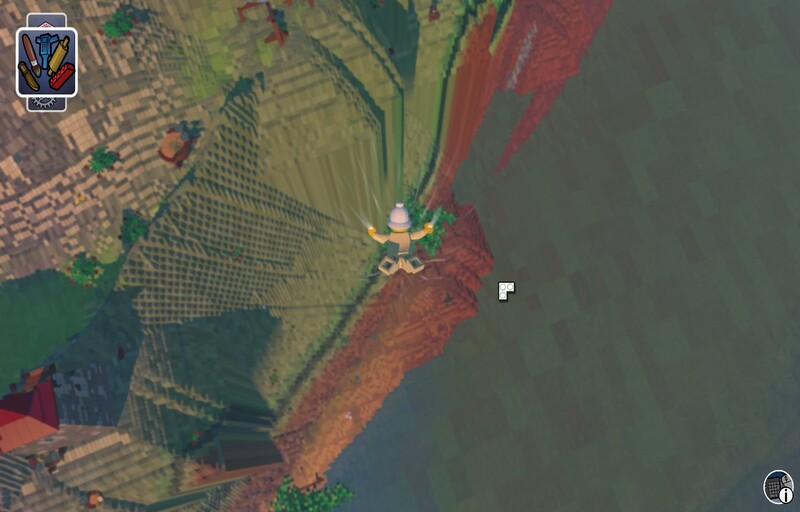 So, is Lego Worlds a Minecraft Killer? Absolutely not. While both games are similar, Minecraft is at this point, completely dominating the market for 3D survival games. Furthermore, I feel like they’re different games appealing to different people. Lego Worlds is much more fun from an exploration standpoint, and I spent a good couple of hours just driving round in a steamroller trying to find new things. At the same time, I feel like Minecraft is a lot better for building in (at the moment), due to the fact that you have a lot more control over the creativity of your builds. The first person camera of Minecraft is also a lot better for building and combat.